The 1970s was the first era that learned how to exploit youth culture, and it was the birthplace of corporate rock. It didn’t last long. By 1977 the Clash had written a song with the lyric “No Elvis, Beatles, or the Rolling Stones” and Iggy Pop and the Stooges had burst forward as the first punk rockers. But Iggy had been there all along, rumbling under the beatific skies of the 1960’s—a disruption into what was supposed to be entertainment and positive vibes. Iggy walked out into the audience, broke glass, smeared himself with peanut butter. Was it a stage show? Was it rock music? Was it real life? 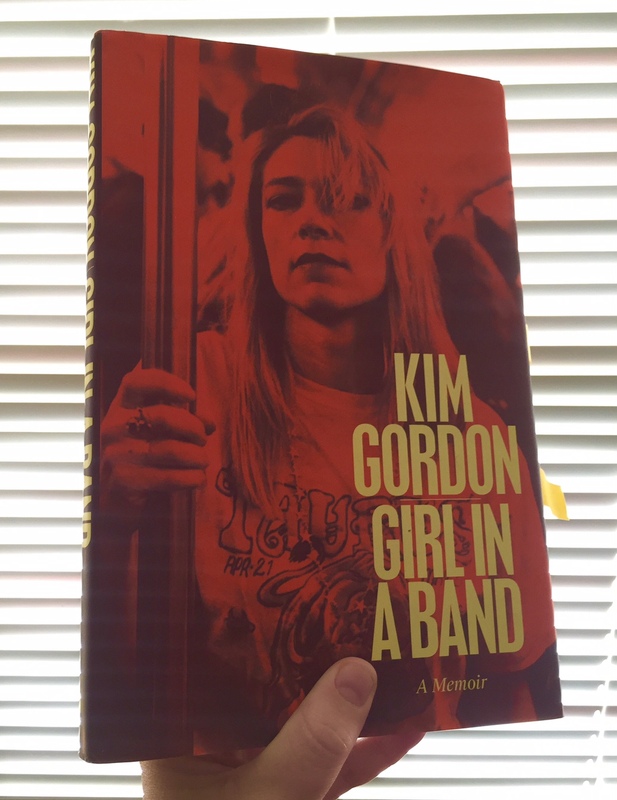 Kim Gordon’s memoir, Girl in a Band came out in February of this year as a reclamation of identity for one of the founding members of Sonic Youth. When I thought about and finally suggested writing a review for The Art Book Review, one of the editors asked me if Girl in a Band was actually an art book, since she hadn’t read it yet. I told her that yeah, I think it is, or at least…it’s close. 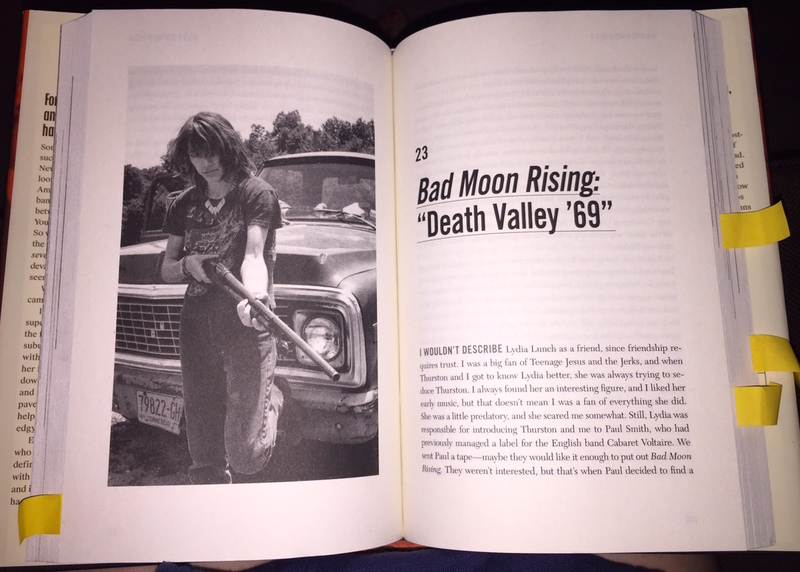 A memoir can be an art book as long as the right person writes it. Because if writing can be a type of performance (Gordon mentions that she loathes the word[s] performance art), then this book has it’s own category of performative agency. Gordon tells us so many accessible, intimate stories of the intersections of music and art, as if she’s reaching towards a Gesamtkunstwerk or synthesis of these outlets, that her history (both personal and public) becomes a remarkable trace of those intersections. The very first chapter goes right to the narrative “end” with Sonic Youth’s last show in Brazil, just before her divorce from decades long band partner and husband, Thurston Moore. And although Gordon writes through the darkness of relationship failure, that’s not the entire narrative. We’re taken on a fairly easy-to-read journey of Gordon’s life: short chapters on her childhood in 1960s California, her time at the Otis College of Art and Design, the early 1980s No Wave scene, working at Annina Nosei Gallery in New York, working for Larry Gagosian, befriending Dan Graham, cheap rent, the inception of Sonic Youth, her clothing line X-Girl, touring, album artwork, friendships, collaborations, fame to a large extent, motherhood, moving to Northampton, MA, her more recent gallery shows. It’s not perfectly linear but there are very common threads throughout. There’s the problem of her older, schizophrenic brother, Keller. There’s figuring out art, music, and collaboration. 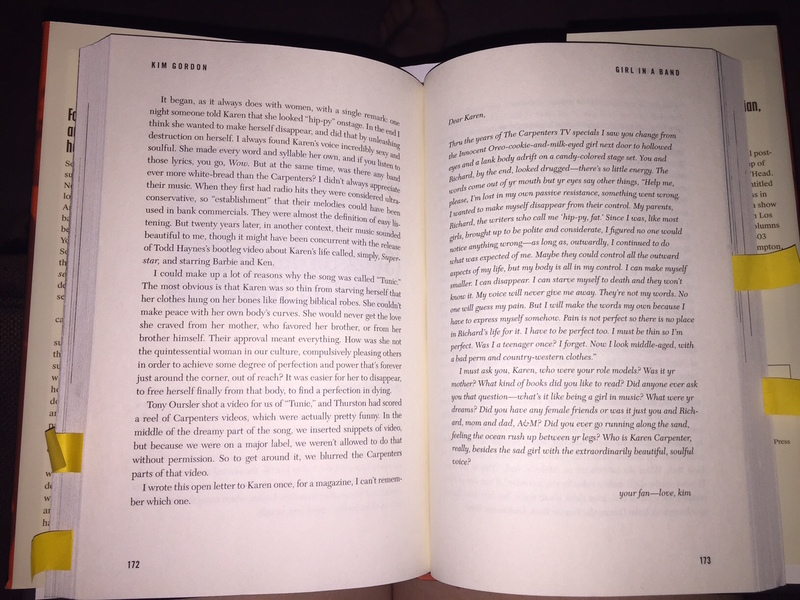 There’s also the issue of figuring out boys/men and her own sexuality in both the personal and image-based, rock-star senses. Gordon touches on some great behind the scenes moments in the music industry, most notably her riffs on Courtney Love: “Courtney was the kind of person who spent a lot of time growing up staring in the mirror practicing her look for the camera.” and that she “might be mentally ill”. There’s “also a slam of mumbling singer Lana Del Rey’s sophomoric perspective on feminism and glorification of dying young. Almost every mention of Kurt Cobain feels slightly gossipy, yet also intimate and sad, and sometimes Girl in a Band seems a bit like a tell-all of sorts, not that anyone should mind. My favorite moments are her memories of Dan Graham in the early 80s (and his idea to include Gordon in a performance piece with an all-girl band), Mike Kelley (whom Gordon was very close to and dated briefly), her open letter to Karen Carpenter, and her first exposure to music critic Greil Marcus. Gordon is making notes on what she remembers as being important. And although she and Greil Marcus are very different writers, she’s tracing history very similarly to Marcus, only it’s an intimate, looser recording from a different vantage point, addressing her various identities as artist, musician, fashion icon, woman, sister, daughter, wife and mother. What’s most appealing about Girl in a Band isn’t the anecdotes or even Sonic Youth, but Gordon’s accessibility and her skill in maneuvering through cultural moments. Gordon is intimate and thoughtful, and she’s no new writer. While Gordon was addressing male artists’ playful femininity in 1983, she certainly didn’t address female artists’ playful masculinity or the idea of women using masculine subject matter – a concept that seems so connected to her public personae. Thirty-three years later, Gordon does address this or at least she finds the right venue for it – an accessible, saleable memoir. Something real.